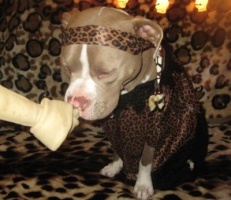 Congratulations to the top three prize winners of the 2010 Proper Pit Bull Howl-o-ween Costume Contest! There will be two contests in 2011. Be sure you don't miss out. Subscribe to our ezine Bully for You! and stay updated on all our events. Our Contest Sponsors for 2010! This isn't your typical "and now a word from our sponsors" type blurb--so stay with me on this. I want to say something about our sponsors because I hand-picked them with a good deal of thought. I picked them first of all because they have great products. And, second of all because they are bull breed owners too. They love bully dogs and they care about the same issues that you and I do. So, I hope you'll remember these fine folks and support them with purchases through out the year whenever you need something they carry. Thank you Nancy, Thor and Rebecca for your generosity and for making this event even more fun and exciting than it already is. Here are the prize packages. Click the links below for more details about each prize. First Place: A $30 gift certificate from The Pit Bull Princess, one Unbreakoball and a custom dog collar from Blocky Dogs. Second Place: A $30 gift certificate from The Pit Bull Princess and one Unbreakoball. 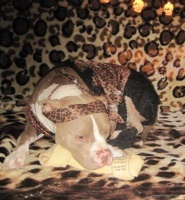 Third Place: A $20 gift certificate from The Pit Bull Princess and one Unbreakoball. Blue Pit 32, Blue Pit 32, Hike! Introducing USC's new Quarterback Bentley! Pitty pumpkin picked from the Pumpkin Pound! 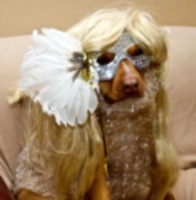 This is our darling pick from a local city pound all ready for Halloween. The cutest pumpkin in the patch! Is it a dog or a squirrel? This is our rescue, BooBoo a brindle and white Pitbull. He thinks he can pass as a Bunny for Halloween, LOL. How many can he convince???? 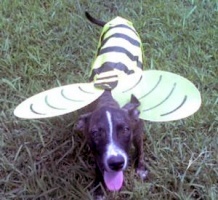 Return from Halloween Costume Contest to Pit Bull Home.